Media Buying has grown tremendously in the past few years. 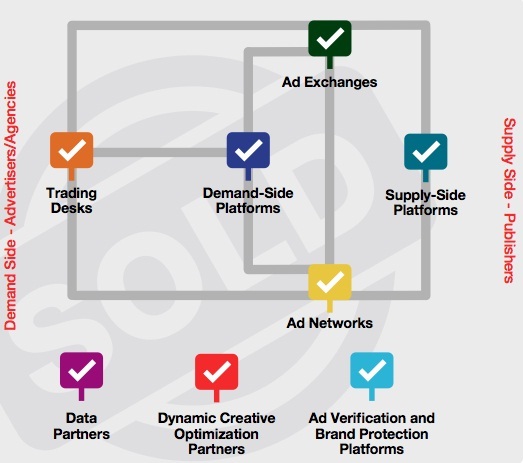 As the ecosystem continues to expand, systems are becoming even more complex and difficult to understand for both agencies and advertisers. In the not so distant past, media purchasing would take place between buyer and publisher until, ad networks came on scene which opened floodgates to mass inventory buying. Once marketers learned they could purchased bulk inventory through aggregators - real-time ad exchanges entered the arena, acting much like the financial markets, trading remnant impressions that publishers couldn't sell directly through in house sales teams. This has ultimately led to automated or programmatic media buying - the large scale automation of inventory purchasing using real-time systems, machine based transactions and algorithmic intelligence. So why exactly, is programmatic so effective? On any device or any channel, programmatic buying connects advertisers to the right audiences - right now. Targeting capabilities have seen sizable improvements in the digital realm and with the introduction of the pixel - agencies and advertisers are now able to gather concrete data points about the consumer viewing a web page. From geographic location, to browser and device information, we can now set targeting criteria at the microscopic level. With programmatic, marketers now have the ability to deliver campaigns to hyper targeted audience segments with greater efficiency and ease, at scale. The fundamental current driving this growth is technology. By leveraging data, analytics, and engagement, we can now paint a clearer consumer picture than ever before. The quantum leaps gained in targeting, optimization, and user modeling, programmatic enables brands to more optimally manage their paid media investments. We are given true visibility into selected inventory: exchange, site, and placement data sets for any given campaign. Top brands can dive head first into any programmatic initiative with the confidence of knowing brand safety remains intact. Premium vs. remnant? Above vs. below the fold? Viewed vs. served? Publishers that initially balked at the prospect of offering their inventory through RTB, with the often misguided belief that their margins would be cut in half, are now setting up private exchanges to sell their unsold inventory directly. As publishers increase their amount of qualitative ad space through programmatic means, the line between remnant and premium inventory is fading. And with recent initiatives, we now have the ability to bid only on inventory that is viewable to the consumer, layering on the value add. With programmatic, advertisers have granular access to every conceivable metric needed to generate highest value. The technological advancements, control, and cost efficiency gained through programmatic buying will play a key role in shaping Digital Advertising's future. Whether for branding or direct response, leveraging the power of data to inform buying decisions will increase exponentially. Advertisers now have the ability to reach and engage target audiences at every point in the funnel, on every device, with online and offline media purchased through this new ecosystem. This contributed article was written by Nicholas Galante of DirectAgents.